Thousand Island Park Landmark Society is a tax-exempt, charitable organization dedicated to preserving the historical and architectural resources of Thousand Island Park, New York for our community, visitors, and future generations. Stewardship is “the careful and responsible management of something entrusted to one’s care.” Historic Preservation relies on stewards, generation after generation, to maintain a sense of our nation’s history. Thousand Island Park is here today because of stewards who have cared for the natural surroundings, maintained the built environment, and nurtured the community. People have always been drawn to the St. Lawrence River and the picturesque islands which surround the Park. The homes in the Park evolved from seasonal tents to summer cottages to year-round houses. 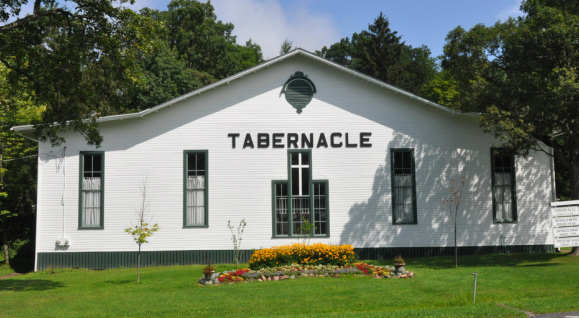 Our community has thrived in the Tabernacle, Library, Pavilion and Guzzle for generations. Through economic booms and hardships – devoted stewards have balanced the need for progress and the respect for the way things have been. As we move around Thousand Island Park by bike or by boat, we feel a pace of life which is timeless. Because much of our built environment has been preserved, when we sit on the front porch and wave to neighbors or open the door to the Library, our actions are echoes of generations past. We instill a love of history in our children by exposing them to this unique place. We must make smart choices for Thousand Island Park. We must imagine our children’s children diving off the main dock shrieking with anticipation of the bone-chilling splash into the River. Thousand Island Park is listed on the National Register of Historic Places because it was deemed worthy, on a national level, of preservation. This is both an honor and a charge to the community to protect the elements of the park that contribute to its national significance. This summer, TIPLS is spearheading an update to our National Register documentation to better catalogue and quantify the history which is so palpable here. By better understanding the breadth of the legacy we enjoy, we can more fully articulate to ourselves and our children why we must work together to be active stewards of Thousand Island Park. This summer, please volunteer to help with the update, visit the Landmark Resource Library to find out more about your cottage style or history, attend one of our window workshops or come learn about the Craftsman/Bungalow style. Let Landmark know what you most appreciate about the Park. We look forward to continuing the important stewardship of TI Park with you. Support the National Register Update - Volunteer your time.